Complement your donut with a delicious beverage. We offer the finest coffee and coffee specialty drinks from our beautiful Espresso bar. Come in and try the suggested "drink of the day" that we'll prepare especially for you, or anything else you'd like. Milk, juices and sodas are also available. Something new to try is our amazing Cold Brew Iced Coffees. They are available in many flavors and will be your new favorite! Our donuts may be purchased individually, by half dozen, or by the dozen. Discounts are available on 1/2 and whole dozens. There are no maximum orders, but if you need more than four dozen per order, we prefer you contact us at least 24 hours in advance. Assortment options are also available. And of course....we'll be adding new items all the time! Celebrate all of the occasions in your life with our decorative donuts. We decorate donuts for major holidays and customize for special occasions. Check out our Facebook page for lots of photos and decorating ideas. 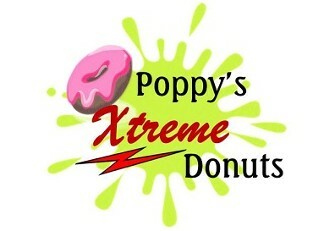 We can do specialty donuts for large events such as weddings, graduation...whatever meets your need. Our Poppy Puffs all decorated up are a great treat to send to school with your little ones to share with their class. The possibilities are endless!